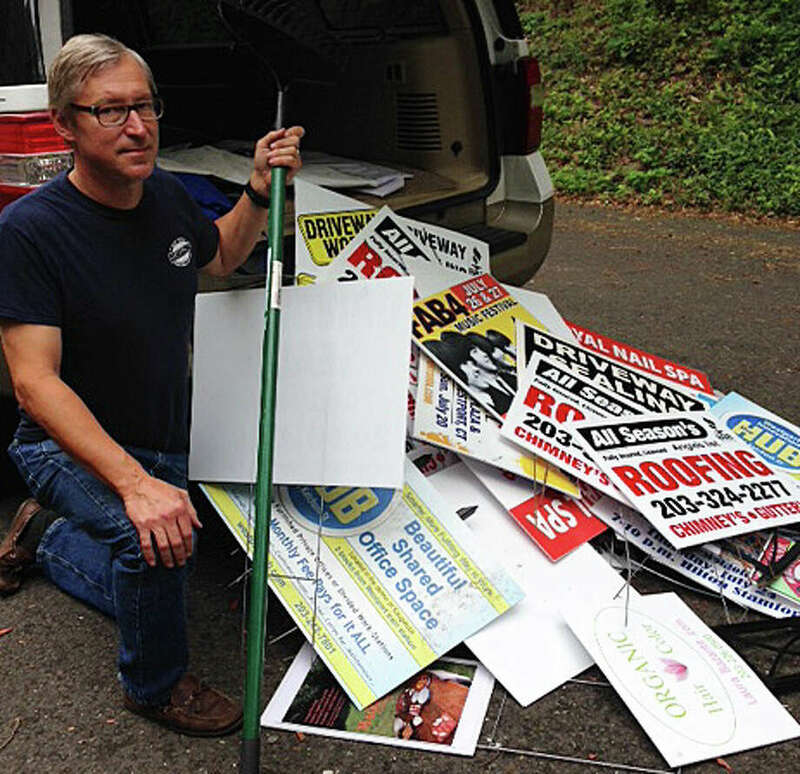 Planning and Zoning Commission member Alfred Gratix Jr., who with P&Z Chairman Chip Stephens is one of the "De-Signers," with a haul of illegally posted roadside signs the men recently took down. Calling themselves the "Westport de-signers," Planning and Zoning Commission Chairman Chip Stephens and fellow board member Al Gratix Jr. have waged a two-man war on lawn signs posted illegally along local roads in recent weeks. At the P&Z's July 17 meeting, Stephens announced that they had taken down "more than 100 lawn signs" during the previous weekend alone. They also have been removing signs nailed to telephone poles, he said. "I just want to educate you to a new kind of subcommittee we have on the P&Z," he told the audience about the "de-signers" and their mission, prompting chuckles among those attending. He said signs nailed to telephone polls are "very illegal" and those posting the signs can be ticketed, fined and prosecuted if they continue, Police Chief Dale Call told Stephens. "I called the state (Department of Transportation) ... about the lawn signs and was told to take them down and throw them away," Stephens added. He said the person he talked to said they are a hazard and should be removed. "We used to give them back, but people would just put them back up," he said. "They are now going directly into the hopper." Stephens, in a telephone interview Wednesday, said that the majority of illegally posted lawn signs -- which cost about $5 to $10 each -- are put up by out-of-towners advertising events or businesses, although a number of them have been for local tag sales. They are usually put on public property at busy intersections. Stephens said he and Gratix don't plan to take down signs for charitable events or political campaigns. Signs on private property are legal. Stephens' quest seems to be working for now because Post Road East was virtually free of lawn signs this week. Only one tag sale sign was spotted near the town's border with Fairfield. In fact, Fairfield also has also been struggling to control illegal lawn signs. According to Joseph Devonshuk, Fairfield's zoning inspectors will remove the signs when they see them, or contact the organization or business that posted the sign to have it removed. But keeping the public rights-of-way clear of all of the signs all of the time is overwhelming, he said in a recent interview. Stephens said the sign removals has been met with mixed reaction. "Some are upset, others are pleased," he said. He said he plans to continue his crusade and is encouraging residents to let zoning officials know when they see them. Call the Planning and Zoning Department at 203-341-1030.